There are few things IÂ despiseÂ more than getting cheated out of my hard earned money just because I am in Canada instead. This is especially true when there appears to be no reason other than greed! Is Microsoft Price Gouging Canadians? My Experience Says Yes! I needed to get another copy of Office 2010 Home and Business for one of my staff. So, I went to Google and searched for the Office 2010 purchase & download site. 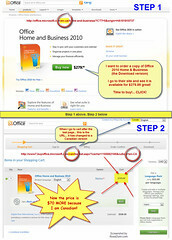 I went there and found Office Home and Business 2010 for sale for a reasonable $279.99. When I clicked “Buy Now” I was taken to a page where… much to my surprise and annoyance the price increased to $349.99 ! !Â What the hell?? As you may notice the first URL I went to turned out to be the US version of the order page (why, I have no idea since I am clearly in Canada) and when I ordered the product the second page which I was spirited to changed my order to a mind numbing Canadian price of $349.99. So, to recap, because I am in Canada, Microsoft believes I should pay $70 more (or 25% extra) to buy the download version of Microsoft Office Home and Business 2010. The Canadian dollar is no longer weaker than the US dollar but in fact stronger (as I write this). This is a download! As a result, there is no shipping involved so it isn’t like they have to pay extra for anything involving shipping or customs. Putting all of this together makes Microsoft look like they are gouging Canadians. Are they? What do you think? Here is a larger infographic of this price gouging: Infographic – Microsoft Office is 25% More Expensive for Canadians! This entry was posted in Opinion, Rants, Software, Technology and tagged Canadian, Microsoft, Price Gouging by rossdunn. Bookmark the permalink. There can’t be many Ross Dunns in the world, but nevertheless I came across your web site in the process of creating my own using Squarespace: http://www.rossedunn.com. (I would have chosen rossedunn.net, but it wasn’t available.) I can imagine people will be going to my site when they want yours, and vice versa. I’m not, however, going to have a huge amount of traffic. My site doesn’t sell anything and offers much less useful knowledge than yours does. But I thought I should introduce myself. My branch of the Dunn family settled in western New York and northwestern Pennsylvania. Three or four generations back they had moved “west” from eastern New York State. I have not been able to trace these Dunns back into the 18th century or earlier. My parents named me Ross after a family friend. Hello Ross! It is a pleasure to meet you. I will email you with a reply to take this conversation to a more private medium but suffice it to say, I have seen you online all over the place and always wanted to meet you – if virtually. I will be in touch and thank you for reaching out!